Caption: Laura Cunningham-Clarke using her new skills in the chapel at Horsforth Cemetery. Trainees have been sprucing up some of the city’s much-loved heritage sites as they get to grips with new learning programme. Historic locations including Leeds Town Hall and Lotherton Hall are among those being protected and preserved by local learners on the Re-Making Leeds heritage construction programme. The programme, which was officially launched last November, recently saw the council appoint three specialist training providers to equip those on the courses with the skills they need to repair and restore the city’s pre-1919 properties. Leeds College of Building, York College and the Heritage Craft Alliance will help trainees learn traditional arts including stone masonry, lime plastering and specialist joinery. They were appointed because of their heritage construction training expertise, resources and working knowledge of the sector. 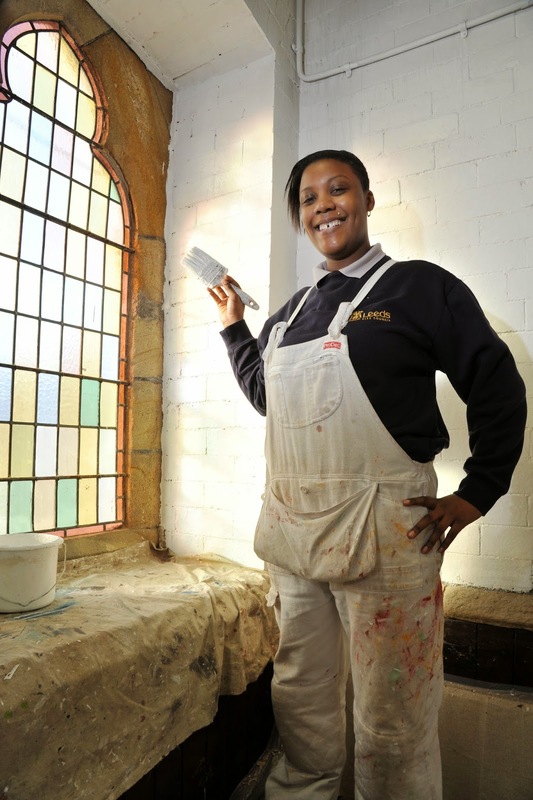 Among those already training on the programme is painter and decorator Laura Cunningham-Clarke, 26, who in the last few weeks has used her new skills at the Town Hall, Lotherton Hall and the 134-year-old chapel at Horsforth Cemetery. Laura, from Meanwood, said: “I first heard about the course when I was at Leeds College of Building doing painting and decorating. “It sounded like a great opportunity so I went for it but it was only when I actually started working on these old buildings that I realised how different to the usual projects it really is and started to appreciate the buildings for what they are. Re-Making Leeds is a three year programme funded by the Heritage Lottery Fund. They also get placements with heritage construction specialists. The training programme includes support to achieve an NVQ Level 3 awards for those already working in the sector, short courses for people already in the construction industry, volunteers or property owners and schools engagement activities to promote the sector. “Re-Making Leeds is helping us to address an important skills gap and giving a new generation of construction workers the training they need to take care of some of our most cherished cultural assets. Over the next three years, more than 400 adults and 150 young people in Leeds are expected to benefit from activities delivered as part of the programme.